CAPE CORAL, Fla. – (Jan. 29, 2018) Eclipse Corporation today announced that DocOrigin Enterprise software now allows companies to design, present, generate and deliver mission critical, dynamic, real-time interactive and batch documents and forms in PDF/A-3 format. PDF/A-3 is the workhorse of all PDFs; it incorporates PDF/A, which is the global standard for archiving and adds the ability to transport other document formats inside the PDF/A-3 file. This means that the Eclipse flagship products DocOrigin, Business Communications Center and Dynamic Business Documents can produce PDF/A-3 in production environments. The PDF/A-3 acts as a wrapper to contain all the documents and supporting files that make up the packet. For instance, in production, if your ERP, MRP, HRP, CRM software is producing invoices, the invoice produced by DocOrigin in PDF/A-3 can contain the matching PO and any other files that are relevant to that invoice. This would prevent the company receiving the document from having to search for the relevant information or documents, which may delay the payment of the invoice. 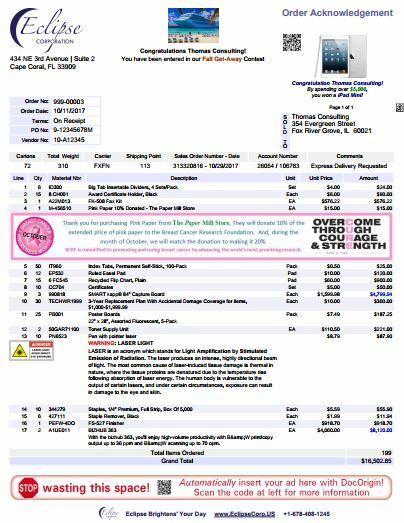 With PDF/A-3, you can send this DocOrigin created Order Acknowledgement with all other relevant documentation such as the purchase order, brochures or pamphlets about related big ticket items they may be interested in, packing slips and more. Think of the time saved and the information you can provide! In banking, insurance, manufacturing and other industries with complex multi-document transactions, PDF/A-3 provides relevant and important content to all parties involved in a single PDF attachment. Since PDF/A-3 is a superset of PDF/A, the global standard for archived documents, you can be assured the document is being presented exactly as the original files were produced. This is important because it means that PDF/A-3 files can be used as a container and file system for digital objects and still viewable1 via a PDF reader such as Adobe or Foxit Reader. PDF/A-3 is a great addition to the PDF standards. For the PDF purest, DocOrigin will continue to support PDF/A and PDF/UA (for people with visual disabilities). Contact Eclipse or one of our global partners to find out more or to arrange a demo. Eclipse Corporation is a leading provider of enterprise document design, presentation, generation, automation and customer communications management software. Eclipse and their authorized partners work closely with clients to provide tailored solutions that conform to specific needs at a fair price. Eclipse’s principles are simple: provide the right solution and get the job done – on time. Our depth of knowledge and experience allows Eclipse to deliver on these principles every time. Eclipse’s enterprise software solutions DocOrigin, Business Communications Center and Dynamic Business Documents have replaced more than 4,000 legacy forms software installations in the past 5 years. 1 The PDF/A-3 carries the attached files inside the PDF envelope. However, the recipient may need other software to open the attachments.